Just across the lane from an otherwise posh shopping center is Hungary’s For Sale Pub, and while the space is not actually available for purchase, patrons can leave their personal advertisements anywhere they would like. Despite the confusing name, the welcoming drinking establishment attracts visitors from all over the world with its shaggy interior, and locals with its hearty Hungarian fare.. Covering every inch of just about every surface are small pieces of paper stapled and pinned by years worth of customers looking to mark their passing. 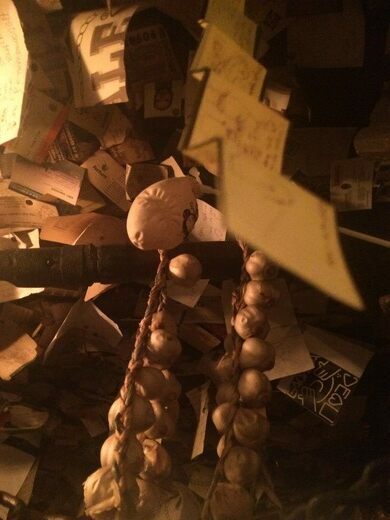 Drawings, notes, business cards, paintings, and pictures are just a few of the mementos that have been attached to the bar interior, making the space look like its grown particularly flammable fur. To add to the oft-noted fire risks in the bar, the floors are covered in straw and patrons are encouraged to shell the free peanuts they are given straight to the floor. The only thing not for sale at this pub is pretension.